A while back we hosted a couple of CouchSurfer's from Turkey, although they are currently living in Northern Ireland. As always, we learned a lot and enjoyed their company immensely - and, they made a delicious breakfast which in turn inspired some re-creation efforts. I haven't been totally confident that my dish is anywhere near the delciousness of theirs, but I'm relatively satisfied and will continue to work out the kinks. 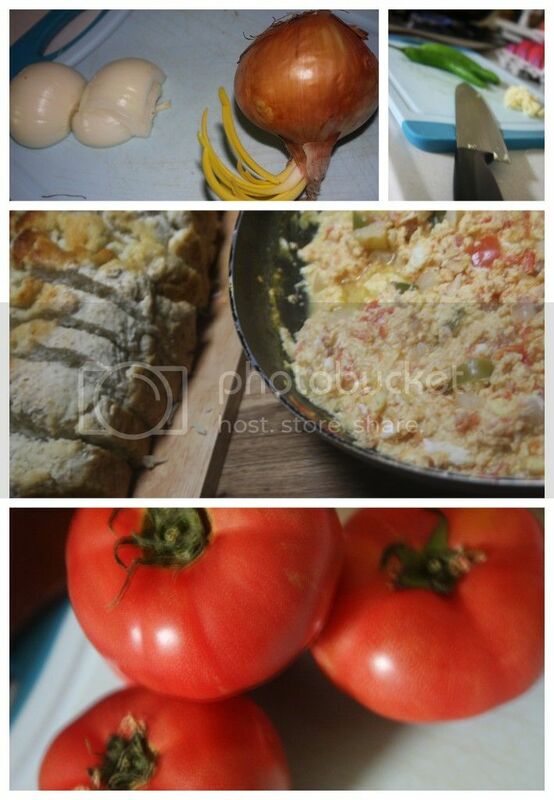 For now, here's a general idea of this Turkish Breakfast we learned from a couple of CouchSurfers! In a large skillet heat a couple Tbsp. Olive Oil, saute 1 chopped Onion, 1-3 diced Green Chiles and 3-4 minced cloves of Garlic. Meanwhile, seed and chop 4-6 Tomatoes. Add the chopped tomatoes to the onion and pepper mixture as well as a dash of Cumin, Salt and Pepper. Leave this mix alone until your ready to serve up the breakfast. 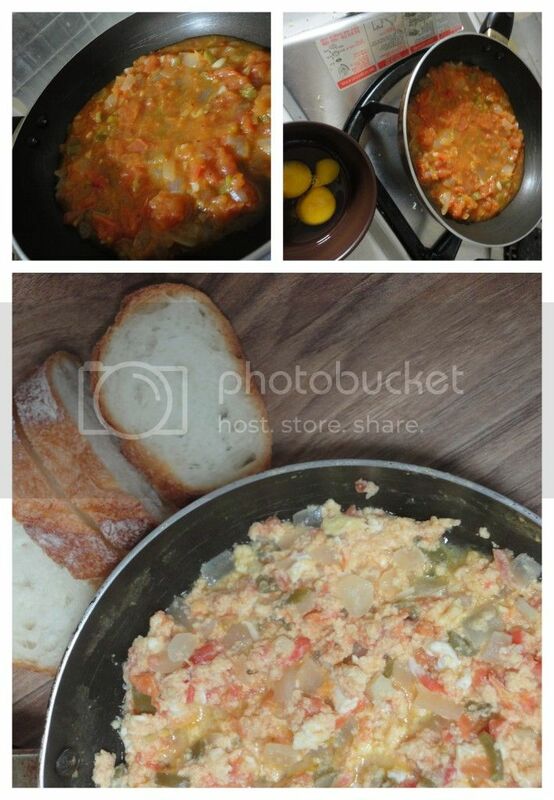 Before serving, re-heat the tomato mixture and whisk 3-4 eggs which you will then add to the heated tomato mixture. Let eggs set for a couple of minutes before breaking a part and continuing to cook the eggs through. Serve this mixture with crusty bread and fine cheese (Feta would be ideal but we use anything we have on hand here in the land of Kimchi). 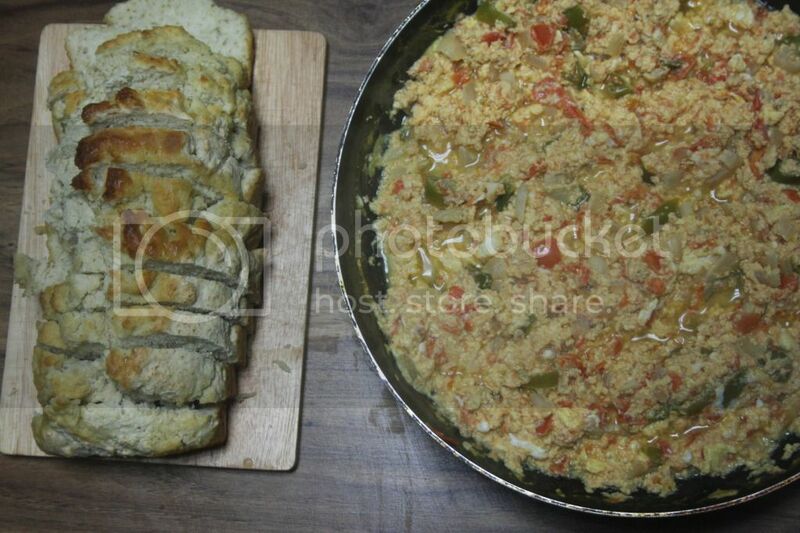 Scoop some of the egg and tomato mixture onto a slice of bread, top with a bit of cheese and place into your mouth - let out a sigh of satisfaction and repeat until the pan is clear.